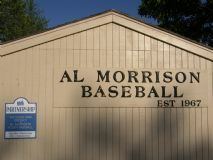 The Al Morrison Memorial Baseball League averages 350 to 400 players, 35 to 40 teams that require 35 to 40 coaches and at least 35 assistant coaches each summer. Boys and girls from the ages of 5 to 16 are eligible to participate in our program. Our complex is located in Page Park along the Rock River on the northwest side of Dixon. It houses five baseball fields (with lights on one field), bleachers at all, a timed sprinkler system to keep the grass green and remote control scoreboards for our Instructional, T-Ball, Future, Bronco, Koufax and Mantle Leagues. Our Concession Stand and storage facility was remodeled and expanded in 2010 with very nice new Men's and Women's handicapped accessible restrooms included in the upgrade. 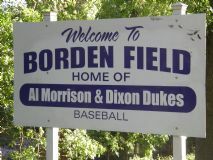 Al Morrison Baseball currently leases the property from Dixon Park District. The program is currently governed by fifteen volunteer Board Members. We provide and pay for umpires for every game. We co-share the property with the DHS Baseball Program and PE classes. We are insured by Harrison Insurance of Dixon. The Al Morrison Board respectfully requests that no outside food be brought onto the complex premises. We are a not for profit organization that relies on our Concession Stand sales to pay for our umpires and concession stand staff. Thank you for your compliance to this request. There is no parking allowed in the Boat Ramp area. There is no smoking allowed on the premises during any Al Morrison function. There are no dogs allowed on the Al Morrison Complex premises. The Al Morrison Memorial Baseball League Board members are open to your concerns, constructive criticism, solution ideas and volunteer help. To promote and protect the safety of all players, to teach them baseball, good sportsmanship and citizenship.